Interested in issues that are under-reported in mainstream American media? Going abroad this summer to South Asia or the Middle East? Apply to be an International Reporting Student Fellow! Any Penn student who is going to South Asia or the Middle East over the summer of 2015 is welcome to apply. Go deeper in your Penn global education by becoming a student journalist for the Pulitzer Center, a leading journalism organization with deep experience covering global issues. Previous journalism experience is not a requirement but an open mind and a willingness to write, photograph and/or create videos is necessary. Center editors will work closely with the fellows on storytelling strategies, reporting methods and travel logistics. 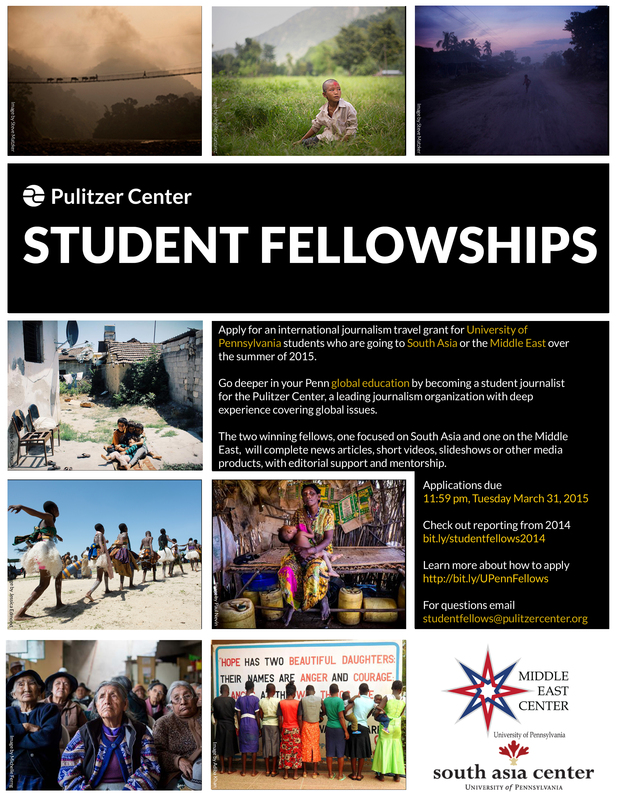 The fellows will participate in a Pulitzer Center-conducted workshop before leaving as well as mentorship and editorial support in the field. The 2 winning fellows, one focused on South Asia and one on the Middle East, will complete news articles, short videos, slideshows or other media products, with editorial support and mentorship. The fellows will help illuminate another part of the world for the Penn community and beyond. The fellows’ work will be published on the Pulitzer Center site and possibly other outlets. The fellows will also be expected to participate in outreach efforts for the South Asia Center or Middle East Center upon return to campus. The winning fellows will receive $500 upon completion of the deliverables, plus invaluable editorial support and mentorship. The fellowship program is the result of collaboration between the South Asia Center and Middle East Center at the University of Pennsylvania and the Pulitzer Center on Crisis Reporting. Applicants should be committed to taking on the role of a journalist for the course of the fellowship. This means asking questions and going deeper into stories. To get a handle on the differences between journalism and advocacy or public relations, please read the Pulitzer Center’s Ethics and Standards Policy. The reporting project can be anywhere in South Asia or the Middle East. The 2015 application deadline is 11:59PM Tuesday March 31st. Click here for the Application Form and instructions for submission. The fellows will be required to attend a workshop with the mentoring journalist at Penn in April. Date TBD. The fellow will be selected and announced by Friday April 10th. The fellow will be expected to complete work associated with the fellowship by the end of August 2015. The fellow will be expected to produce several media pieces such as blog posts for the Pulitzer Center website, articles, video and/or slideshows. The fellow will work with Pulitzer Center editors to determine a set of deliverables for the project appropriate to the fellow’s past experience. The Center will provide technical and editorial support through the planning, reporting, and writing/production phases of the fellowship. The strongest applications will identify an untold story and present a clear, succinct plan for telling that story. Take a look at reporting on the Pulitzer Center's site to get an idea of how journalists pitch their projects and to avoid pitching a story idea that has already been covered.